So your tired of eating alone, and you can't always make it to the Masjid (mosque) for Iftar (meal after breaking the fast). Invite a friend or 2 over, maybe couple who lives close by. One of the beautiful things about Ramadan is sharing a meal with your fellow believers. Who said this has to be relegated to the weekend. With easy entertaining ideas, enjoying Iftar with company can be done any day of the week.. weekend or work evening. One of the easiest ways of making a mid week group Iftar is to use ramekins. The portions are already pre-determined in a neat little package, and they are SUPER cute. Serve with a salad and you've got a great meal! In large non stick skillet, coat the bottom of the skillet with Olive Oil. Add the Trinidad butter, garlic, red pepper flakes, thyme and rosemary. Turn the heat on medium high. When the garlic starts to dance (sizzle around the edges) add the onion and sweet pepper, salt the vegetables. Sauté until the onion are translucent and soft. Add the seasoned ground turkey to the skillet, cook for 1 min before adding the Worcestershire sauce, ketchup , pepper sauce and paprika. Continue to cook the ground turkey until fully browned and all the juices have dried out. Place the potato cubes and smashed garlic cloves in a pot and cover with water. Salt the water and put the pot on the stove over high heat. When the potatoes are half way done, add the broccoli to the boiling water. When the potatoes and broccoli are tender, drain off the water, and add the butter, milk, cream cheese and about half of the cheddar cheese. Mash together with large fork or potato masher until you reach a smooth consistency ( a few lumps are fine). Arrange your 4-6 ramekins on a baking sheet. 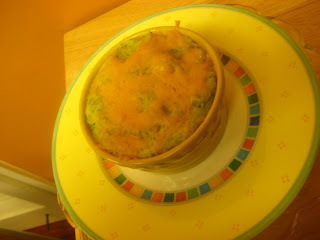 Evenly distribute your cooked meat in the bottom of the ramekins and top with generous helping of the potato & broccoli mash. Top each individual pie with a sprinkling of breadcrumbs and the rest of the cheddar cheese. Serve on small plates with a salad.. and enjoy! How do you make having people over for Iftar easy on you? ?